When Netflix (NFLX) reported its third-quarter earnings last Tuesday, many investors breathed a sigh of relief as concerns about slowing subscriber growth proved to be unfounded. The digital streaming company exceeded analysts' expectations in terms of new subscribers, adding a net 7 million new subscribers for the quarter, exceeding its own previous forecasts by 40%. The Street had anticipated only 5.3 million new subscribers. The digital streaming powerhouse logged earnings of 89 cents per share on revenue of $4 billion, beating analysts' expectations of 68 cents per share and revenue of $3.986 billion. But while some investors may have been ebullient at the dramatic increase in new subscribers and the stronger-than-expected reported earnings, astute value investors should be mindful of two salient issues that will define the fortunes of the company for the near and intermediate future: the inexorable rising costs of producing a never-ending stream of new original content and the arrival of some formidable competitors. When Netflix first entered the original content business, its earlier offerings, with few exceptions, were rater tepid and amateurish. Investors were forgiving because no other companies were offering original content and customers understood that most of the Netflix offerings were licensed from other producers or legacy media companies such as Disney (DIS), who will now be a direct competitor. Over time, the company's original content productions improved dramatically to first-rate status. With an increase in quality came a dramatic rise in expenditures, as costly bidding wars ensued for securing established and successful Hollywood producers and directors with proven track records. Ironically, in some ways, Netflix is a victim of its own success. Currently, the company's existing customers' appetite for original content is voracious. The company whetted that appetite and now their loyalty will depend on continued new offerings on a recurring basis. In addition, investors need to be mindful of the fact Netflix's costs of producing original content are now worldwide. The company's subscriber base now extends far beyond America's shores to other large and varied geographic regions. It needs to satisfy viewers in these new countries and regions, each with their own unique tastes and entertainment preferences. These rising costs may not substantially impact earnings at a time when the company is consistently bringing in new customers. The digital streaming market in which the company has operated with great success for the past 10 years, however, will no longer be free from competition. Although Netflix has a substantial lead and indeed pioneered the advent of the on-demand media phenomenon, that doesn't mean it can rest on its laurels. Its current principal competitors come to the game with substantial assets and cash to produce and offer original content to consumers. While Netflix is still the undisputed leader in the streaming content market, the entry of two new players with substantial resources means Netflix will need to continue to spend more on original and varied offerings in order to maintain its dominant position. The lurking danger for Netflix in terms of maintaining its competitive lead is that as new companies enter the fray looking for a piece of the lucrative streaming market, the increased competition will at some point inevitably lead to lower monthly or fixed fees in order to retain its existing customer base. As Disney and the newly combined AT&T (NYSE:T) and Time Warner will both be introducing their own streaming services in 2019, the monthly fee structure for the digital streaming market will no longer be inelastic. The enhanced competition among Netflix and new legacy media companies such as Disney could eventually lead to a situation of mutually assured financial destruction. One company's increased spending on original content could trigger a comparable response on the part of other competitors to match the spending in order to satisfy existing subscribers, who are not contractually bound to remain with Netflix or its other competitors. Over time, the prohibitive costs to maintain a presence in the market will impact earnings growth. Consider Netflix costs in producing new content. In order to keep bringing in new subscribers to the fold, the company's cash-burn rate for producing new content jumped to $859 million during the third quarter as opposed to $465 million for the same period last year. And these earlier figures were from a period when the company was the undisputed leader in the field, with no viable competition on the horizon at that time. Although the company claims it projects its full-year burn rate to be on the low end, between $3 billion to $4 billion, this lower rate, given the new competitive environment, will be only temporary. It is also interesting to note that Netflix plans to borrow an additional $2 billion to fund new exclusive series and other novel content. This amount is in addition to the company's $11.8 billion existing debt. Currently, the stark reality is that Netflix is spending more money than it is taking in. 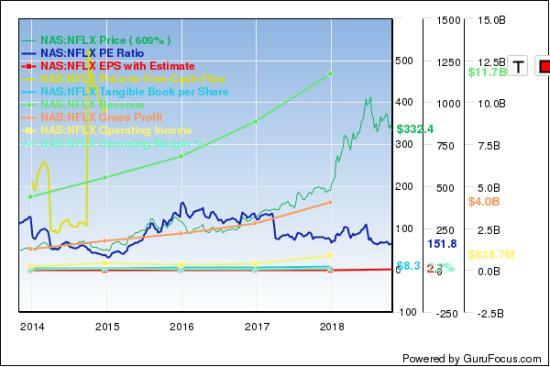 Based on these factors, FANG-addicted investors may wish to re-examine whether a company facing these challenges warrants a current valuation of $338 with a price-earnings ratio of 120, especially in light of the fact the stock price is up 77% for the year. Indeed, some Wall Street analysts are reducing their target prices. Morgan Stanley recently cut its 12-month target from $480 to $450. Goldman Sachs followed with a new target price of $430, down from $470. Raymond James also cut its price projection from $440 down to $400. Given the new competitive realities Netflix will soon face, value investors may want to reassess their growth expectations for a company that has helped lead the FANG group and the overall market to unparalleled levels.